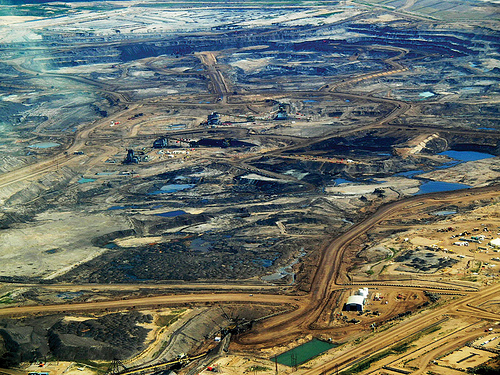 Petroleum extraction from “tar sands” – in Alberta Province, Canada (pictured), or elsewhere – is not “clean energy” production. Photo credit: howlmontreal (via Flickr, Creative Commons license). In the famous words of many politicians, “elections have consequences.” As U.S. President Barack Obama begins his second term in office, he will have a momentous choice to make on whether the proposed Keystone XL Pipeline – to connect Alberta’s huge tar sands deposits with the Gulf of Mexico – will move forward. And, given the recent indications of Obama’s new Secretary of State, a final decision on the pipeline’s fate is looming. There can be no doubt that a Mitt Romney administration would have quickly approved this massive infrastructure project on national security and economic grounds. Given Obama’s recent signals on climate change, though, approval of the Keystone project is in doubt. Canada, of course, is lobbying hard for U.S. approval of the new pipeline. If connected with potential markets, the tar sands deposits in Alberta could place Canada on par with Saudi Arabia, in terms of fossil fuel exports. And as the energy geopolitics expert Michael Klare argues, the death of the Keystone XL Pipeline could be the death of the Canadian tar sands industry. That is not a minor diplomatic proposition, even among old allies. The green coalition opposed to the pipeline is right to raise the long-term, global issues associated with climate change. For so many reasons, mobilizing action on climate change in America has been fraught with difficulties. It has now been over twenty years since the Rio Earth Summit placed a spotlight on the negative impacts of climate change. At some point – and soon – elected officials must show some true courage on these issues. Klare is right to identify the Keystone decision as a defining climate policy choice for Obama’s presidency. Global food security is at stake. Modestly cheaper energy prices won’t matter much if they are overwhelmed by much more expensive food, caused by climate change. Nor should we overlook the destabilizing effects of higher food prices in weak and failed states. The geopolitics of climate change is about much more than rising temperatures. One of the central risks of global climate change – already being observed – is restructured precipitation patterns. Though there has been too much hype to date about “water wars,” there are many plausible future scenarios under which states will go to war in a bid for fresh water. Climate change – barring a reversal of our present global course – is likely to lead to more civil wars and regional conflicts around the world. Mr. Obama (and Mr. Kerry), the ball is in your court. Last month, a coalition of organizations released the seventh annual Global Hunger Index report. The report is sobering reading, and highlights ongoing challenges of governance and environmental stresses. The report also includes a revealing summary map that details the most food insecure countries and regions. Seventeen other countries are also in dire circumstances. Of those states, the main cluster is in Africa, particularly across the Sahel region. The African states include: Sierra Leone, Niger, Chad, Central African Republic, Sudan, South Sudan, Ethiopia, Djibouti, Angola, Zambia, Mozambique, and Madagascar. 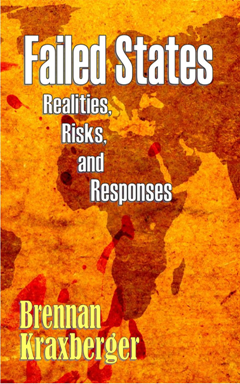 Finally, by way of the main summary findings, there are some important weak and failed states that have not yet been mentioned. The report did not classify the Democratic Republic of Congo, Somalia, Iraq, Afghanistan, and Myanmar (Burma), since no data were available for these countries. Limited access to basic data is a fundamental characteristic of weakly governed states. It is quite likely that most of these “no data” states would also be included in the list of most food insecure places, if reliable information were available. I direct an emergency food pantry, and I have seen the face of hunger in my home area. The magnitude to the challenge is so much greater in places like Haiti and the Sahel. Even as many countries have seen gains over the last 30 years, the effects of climate change and rising energy prices are now significant stressors. Addressing ongoing global hunger issues will require more concerted local and global action. On Friday, the U.S. Department of Agriculture revised its forecasts for staple grain harvests. The news was not good. America’s worst drought since 1956 is now set to impose suffering on a much wider segment of the world’s poor. Even in good times, the world’s poorest devote a majority of their monthly budget to food. As the reserves of basic staples decline and prices begin to rise – as they did so remarkably in 2007-2008 – families face tougher choices about school fees, caloric intake, and other essential needs. What do these recent development have to do with global climate change? Probably a great deal. Droughts have occurred since time immemorial, but the frequency and intensity of droughts is likely changing with global warming. Long-term climatological models – those that forecast out 50 years or more – indicate greater extremes of precipitation, both in terms of spatial pattern, and across years. This year’s drought in the U.S. is not at all the worst case scenario for global food security. Areas least able to cope with intense, widespread droughts are those most likely to see long-term transformations of their regional climates. South Asia, the Middle East, and Sub-Saharan Africa are forecast to become drier and more prone to debilitating droughts over the next decades. These regions have the fastest population growth rates in the world, and South Asia and Africa have few financial resources available to mitigate the effects of these droughts. Countries like Mali, Chad, and Pakistan still have more than half of their population in agriculture. It is not realistic for these agrarian societies to abruptly shift to urbanized, industrialized economies and societies as a way of addressing new regional climates. Perhaps bio-technology will be of some help. Absent concerted action on global climate change, many of the world’s most fragile states are now staring at more frequent and intense droughts that will bring humanitarian crises and exacerbate other political tensions.